Pawfect Birmans, established in 2017, is a small cattery located in Cherry Hill, NJ. 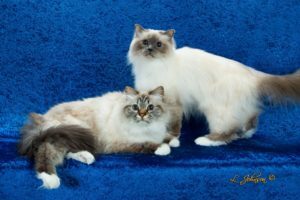 I had my first two Birmans growing up, after my parents went to a cat show and fell in love with the breed. Now, I acquired my own Birman, Leo. He is so beautiful and has such a great disposition I asked Leo’s breeder about showing him. I took Leo to many shows and he became a Grand Premier within his first year of being shown. Since I am enjoying Leo so much, I decided to get Leo and I a new friend, Morrie. Leo and Morrie became best friends the first time they met. Morrie, too, is now a Grand Premier and a Regional Winner for two consecutive years and continues to go to shows with me. After attending many shows, I became friends with many Birman breeders. I met Carol List, of Voijer Birmans, and she became my mentor. After much discussion, I decided that I would like to breed Birmans, so that I may share the enjoyment and satisfaction they provide with others. Carol afforded me the opportunity to obtain my first Queen, Voijer’s Omorose of Pawfect, or Rosie, as I call her. I am looking forward to this new venture and hope to bestow many people with Pawfect Birmans. Unfortunately, Rosie was unsuccessful at having kittens. I am currently waiting to get a new Queen so I can try again.